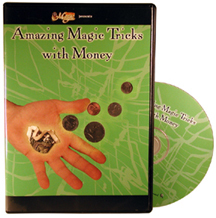 Discount Magic - Amazing Magic Tricks with Money DVD. On this DVD, you'll learn a host of minor miracles that can be performed with everyone's favourite ordinary item - money. Notes and coins grab interest immediately, and can be rustled up at a moment's notice, making the tricks on this DVD ready to perform practically any time and anywhere. And best of all, there's no difficult sleight of hand to learn. -Balance a note on your hand and cause it to slowly lay down on command! -Push a pencil through the centre of a note yet leave no hole! -Vanish a marked penny from one hand and cause it to appear under the other! -Cause two notes to melt through each other - right under a spectator's nose! Amazing Magic Tricks with Money On this DVD, you'll learn a host of minor miracles that can be performed with everyone's favourite ordinary item - money. Notes and coins grab interest immediately, and can be rustled up at a moment's notice, making the tricks on this DVD ready to perform practically any time and anywhere. And best of all, there's no difficult sleight of hand to learn.